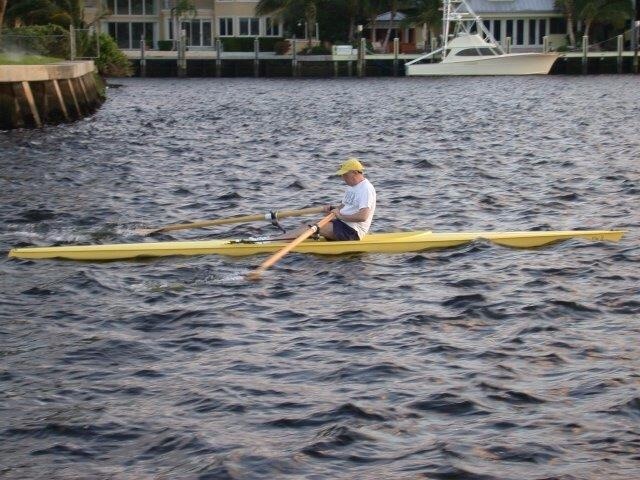 Author rowing on the Intracoastal, Ft. Lauderdale, Fla. The author rows a 21′ long ultra-lite Alden Star rowing shell the average person can lift and launch into the water. The oars are top-of-the-line oars hand carved from light wood in Vermont. A pair of oars will set you back about $400 but, in the opinion of the author, the cost is well worth it. While more expensive than oars made from PVC, the slightly heavier weight lends more stability. And with experience, the combination of the ultra-lite shell propelled by the wooden oars create an experience that is just this side of heaven. The shell flat flies over water when the wind is down and the water flat. Rowing on the New River Sound, or almost any tidally-influenced inland waterway, is a rough way to row. While I have rowed as fast as 10 knots in ideal conditions, those instances are few and far between. The best conditions are those found in flat water low or no wind such as lakes or closed non-tidally influenced water. The New River Sound is a portion of the Intracoastal Waterway that runs from Lighthouse Point south through Fort Lauderdale to Hollywood, Fla. The author took up rowing when age no longer accommodated running. I enjoyed running. But after discovering rowing, I’d say that rowing is a better conditioning experience with less stress on the feet, ankles, and knees. One caveat: talk to your physician before undertaking any exercise regime and find the right one for you. This entry was posted in Atlantic Intracoastal Waterway, Atlantic Ocean, Recreation and tagged Atlantic Intracoastal Waterway, Fla., Fort Lauderdale, Hollywood, Lighthouse Point, New River Sound, rowing shell on February 8, 2015 by Florida's Big Dig.